I currenltly use the 66% size bags with my install of Fetish Nightfall, and I really like the new 9-slot trade window, especially PresumedEvil's "unhooked" version. 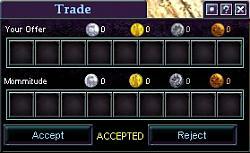 I didn't, however, like that my trade window slots were so huge compared to my bag windows, so I decided to shrink them. While I was at it, I also made an enhancement or two. 'ACCEPTED' now shows in yellow text to be more eye-catching. Entire window has been streamlined, to take as little screen real-estate as possible. Some folks, especially those with higher resolutions on smaller screens, might find these a bit small, but that's ok - I made it for me.